I am passionate about providing my children with educational toys that promote interactive play and the use of their imaginations. Discovery Toys is an excellent resource because all of the toys are designed to help parents “Teach. Play. Inspire.” There is a wonderful selection of high quality toys, books, games and music for infants through school age children (ages 5-8). 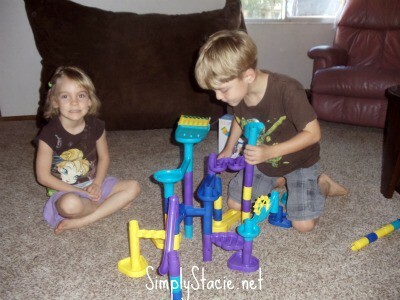 I appreciate that Discovery Toys products are high quality and affordable……..as well as fun! My eldest son, age 6 is a builder just like his father so I was confident that he would love the Marbleworks® Starter Set. What I didn’t expect is that this toy would immediately become a huge hit with all three of my children (ages 3, 4, 6) as well as their neighborhood friends (ages 7 and 8). The Marbleworks® Starter Set includes 46 tubes that can be interconnected along with chutes and bases to create a raceway for marbles. The marbles zoom along through the course as the kids shout and cheer for their marble to make it through to the end. There are so many different courses that can be built and my children will literally play with this toy for over an hour at a time. I home school my children and therefore I was very impressed when my son explained to my husband that it was a “gravity experiment” as he proudly showed him his latest Marbleworks® creation. I also appreciate that it teaches them about “cause and effect” because they have observed that the marble will fall differently depending on how they have set up their course and they are always ready to improvise and rebuild as necessary. This is one of the toys that I encourage them to play with daily because it is not only educational but a lot of fun too and they are only to happy to oblige and start playing with Marbleworks®. The quality of this set is impressive because the pieces snap together easily even for tiny hands and it stays together solidly to allow the marbles to move through the course. 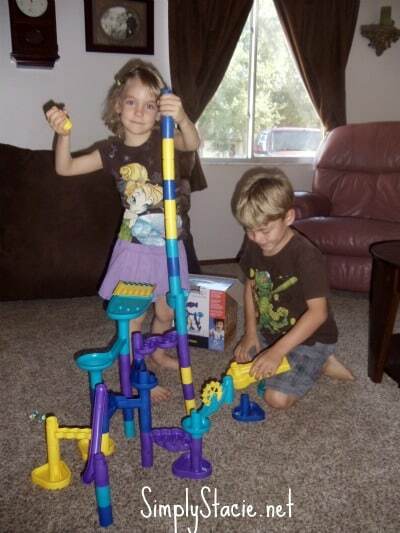 The Marbleworks® Starter Set is an excellent value at only $37.50 and there is also a Deluxe Set and accessories. This would make a great gift idea for children ages 4+ and is sure to played with over and over again. Independent Consultant for Discovery Toys®, Bethany Koljonen is very helpful in selecting the right Discovery toys, books or games for any child. You are invited to contact Bethany so that she can help you find the perfect gift that is sure to be a hit for any special occasion or the holidays. I also encourage you to visit Bethany Koljonen’s Discovery Toys website to purchase Marbleworks® or to view the entire selection of Discovery Toys! I like the Little Mouse; Red Strawberry; Big Hungry Bear Book &CD. I love the marbleworks sets!! I like the zip track. My favorite item is the Flip flop faces bean bag game. I love the Block it toy. I really like the sunshine market toy and the word match first words! I love the marble works sets! I also like the Go Go Caterpillar! MONKEY SEE, MONKEY DO looks very nice!